Sunny days invite us to come out and make outdoor life equally significant to indoor. It raises the need for outdoor landscape and patio seems the most feasible option. Building home is a one-time investment in the life, and you have to bear the high cost to make it usable and comfortable throughout the lifespan. It makes sense when you are thinking some extra bucks on the construction of a decent patio with the sumptuous material, alluring design, and gorgeous look-n-feel. Before going to invest heavily on patio building, let’s have a discussion on its pros and cons. Of course, many have confusion between the definition of patio and deck in this regard. Therefore, I would like to clarify that deck is an inseparable part of a house while patio maybe or not a part of the house. It has different usability, use-cases, and appeal in the statement of beauty in the home and its surroundings. A lifespan of a paver patio greatly depends on the material applied. The wooden patio has the least durability. The concrete patio has a bit longer lifespan. High-quality stone craft is lasting more than a quarter of a century (25 years) and sustain without much maintenance. Conclusively, we can say natural stone pavers or artificially layered concrete blocks are the best options to apply in patio build. 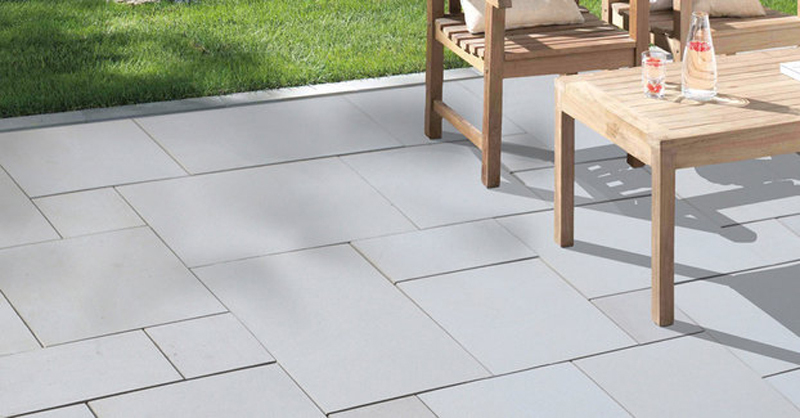 In due course, I would like to recommend products of ‘World of Stones’ like Geo Ceramic Paving, which has a durable topping of parceling coat over the strong but permeable concrete slab. Concrete is better at strength but its consistency thanks to reinforcement renders it susceptible to load bearing when soil beneath it is leaving the required support for many reasons including earthquake and land sliding. In such circumstances, small pieces of natural stones, high-quality concrete bricks, round stepping stones or concrete slabs with an artificial coating (topping) prove the sturdiest material. It may have three to four times higher strength compared to rests of material options in making paver patio. With natural stones used in patio paving, we can grab following advantages. The zigzag design gives it a solid interlocking. A lot of individuals units disperse any scale of load evenly and directly to the ground. High-quality filler material in slits offers it a long life. Outdoor construction always becomes a victim of extreme weather conditions taking place during rain, hot, and cold climates. Rain can drain charm of materials used in paving patios. It also penetrates into the material thanks to its natural porosity, and eventually weakens it. Heat lead to an expansion of patio material unit as well as the ground/land beneath it. Cold can contract the material unit and underneath the soil. If your installation of paver patio is in a standard manner and used high-quality materials, you can overcome these depicted shortcomings easily. Proper construction can minimize the movements of units, and high-quality material eases the washing or de-staining quick. Technically, these all is not possible with external surfaces of your home and every alternate year you have to bear wear & tear expenses. It is never in the case of paver patios at all. As discussed earlier, paver patios have individual small units of various materials such as bricks, woods, concrete tiles/bricks, and stones. It makes replacement easy and quick compared to breaking a portion of an entire concrete slab and filled it again. You can sweep or blow the debris of the surfaces of patio immediately you noticed it. You can clean the most stains with soap and water or apply chemicals to remove tougher ones. Poly-sands like alternatives provide lifelong protective sealing against all wears & tears. We have seen in sections-above that paver patios have varying types of materials used. It offers room for design creativity within your budget too. Today, if you look at a big destination like ‘World of Stones’ in the USA, it offers an exclusive collection of natural stones with rich colors, varying textures, attractive finishes, and smooth edges. It enables you to design your landscape as per your inspirations or according to plans of your landscape designer. When you are inclined to artificial materials, Beige Travertine from World of Stones has a range of offerings for your patios. It is the true construction of paver patios are an expensive option. It best suited for even ground, so the cost of leveling and laying foundation is a bit high. It has a longer construction cycle compared to a concrete patio with a single slab. For instance, the installation cycle consists of the following essential steps. If you compared a low-cost brick paver option with the same sized stamped concrete slab patio, it found a 30% higher upfront investment. When you go for high quality and costly options like decorative stones and toppings on it, you may end up with more than 50% upfront investment. A Paver patio is consisting of numerous small units forming tons of slits between those individual units. Sands are filler material, and easily wash out by rains or during regular water washing. When seeds of weeds floating in the air settle down in these slits and get humidity/water to grow, weeds can spoil the look-n-feel of your paver patios. It can damage the patio material in the long run and boost the wears & tears processes. Removing weeds and reinstalling the entire paver patio within three to four years seems daunting. The many States require prior permissions, and it may take time and fees to pay the local authority. Some paver patios are demanding additional cost and efforts such as demolition of the already constructed structure new wall covering up as per design, step building, infrastructure for drainage, supply, and electricity, expenditure on sealers, coating, finishing, and much more. The success of paver patio greatly relies on some vital factors such as the selection of material, manufacturer, and installation services. If you look for perfection in each vital aspect of the success, World of Stones in the USA have capabilities to allocate all at highly market competitive rates. You will have a free consultancy with transparency and lifelong support for maintenance as well as your queries. your is the best I have found out so far. I wanted to thank you for this wonderful rеad! !